I always get the impression that the level of the sea rises whenever I take my Hasselblad in for a dive. 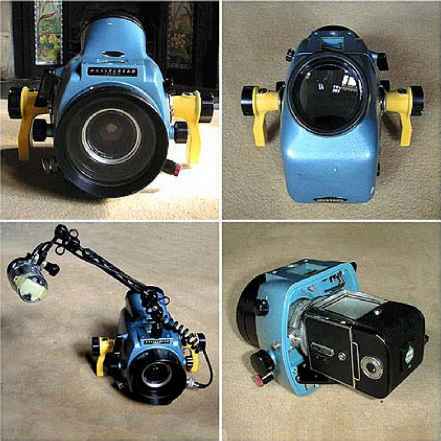 Ok, that's a slight exaggeration, but there is no denying that taking medium format cameras underwater requires a sizable housing. Size also means weight to achieve neutral buoyancy; hardly ideal for travel. Manual focus, manual exposure, no TTL, I even have to wind the film on. Why do I bother? Well, the answer is clear, well translucent, and measures of two and a quarter inches square, that is 60 mm in new money. Medium format transparencies are not a small improvement over 35 mm, they are in a different world. In this article I hope to pass on some of my experiences in my adventure crossing from a modern 35 mm SLR to a fully manual roll film SLR. 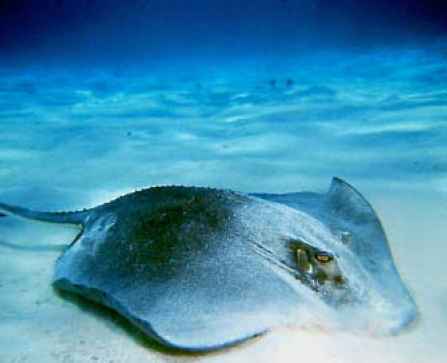 Southern Stingray. Hasselblad 500C with Zeiss 50mm Distagon in a Hasselblad housing. F8 @ 1/60th. Sea & Sea YS120 on 1/2 Power. Fujichrome Provia 100ASA. Scanned by photographing transparency on a light box with a digital camera. Clockwise from top left. Head on view of the flat port. The photographers view of the massive viewfinder. The camera mounted in the housing. Modern flash attached to new synch socket fitted by Warren Williams. 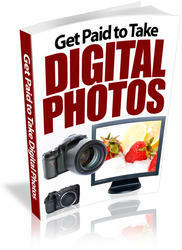 digital cameras, or pixel sizes of computer images). My kit, which has all been pre-owned, consists of a rusty Hasselblad 500c SLR camera with a Zeiss Distagon 50 mm lens, which has a field of view roughly equivalent to 20-24 mm on a 35 mm camera. 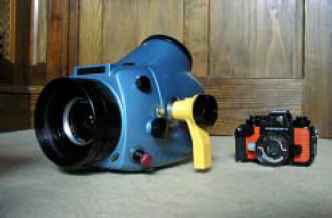 The housing was made in the 1970s by the Hasselblad Underwater Division and contains the viewing prism. When I got the housing it had been sitting on a shelf for a couple of decades, so I contacted Peter Rowlands about getting it serviced. Peter put me in touch with Warren Williams, who had worked on these cameras in their heyday. Warren soon had the housing functioning like new, well better than that in fact, because he replaced one of the old style synch plugs with a Nikonos type plug, so I could now use flash although of course without TTL. In the water the Hasselblad sheds its pounds. It is slightly negative and a little nose heavy, but with a handle on each side it is easy to control. The viewfinder is monstrous and I can almost look through it with both eyes simultaneously. The view is dimmer than that of a 35 mm camera because of the slower lens (f4) and its large size of the viewing screen. Although in well lit tropical waters the screen is bright and makes focusing straightforward. As a photographer of the electronic age, I had previously believed that my fingers were for operating autofocus, and that manual settings on flash guns were just that, a feature only for the instruction manual. So the change to the battery-less Hasselblad was a shock. But I quickly warmed to the system and using it became a pleasure. Its chunky gears are as smooth and certain and the extra concentration required makes each photograph more precious. The involvement in the creation of each image is such that my 35 mm pictures now feel like snap-shots. The satisfaction is immense. Many of the rewards of underwater photography are not just in the results but in the process of going in the water and putting images together. Electronic aids remove some of the difficulty, but also some of the pleasure. Manual exposure is a problem and endless bracketing is not practical with only 12 shots per roll. I always dive with a second camera to meter for ambient light. This solution works well partly because I do not have a light meter and also because it gives me a second system to use once my 12 "big shots" are exposed. My general technique has been to trust my ambient light readings and then bracket for the flash by shooting at different flash distances and powers. For the future, I have been offered a 70 mm film back, which will give me 70 shots per dive and a lots more flexibility for bracketing. Size matters. In comparison to the petite Nikonos V the Hasselblad is monstrous. However, its bulk belies its surprisingly easy handling in the water. using the Hasselblad in well lit waters, and the depth of field has not been reduced too critically. To enable me to use smaller apertures and increase depth of field I have tended to use 100 ISO film, where I might shoot 50 ISO on 35 mm. Even higher film speeds could be used to get around this problem, especially with the increased quality of fast slide films introduced in the last few years. Another solution for the reduced depth of field is in subject selection and composition. A simple background is not harmed by being out of focus, for example blue water is not ruined if it is not sharp. In my opinion reduced depth of field can have a positive effect. Many underwater photographs are taken to maximise depth of field but with less range in focus the subject can have more impact, something Steve Norvich pointed out for macro photography in the last issue of Underwater Photography. The Hasselblad produces a square picture format. A big advantage of this is that flash positions do not have to be changed as much as there are no vertical or horizontal compositions. I have also found the square format a suitable shape for many marine subjects and a refreshing compositional challenge. One unforeseen problem of my medium format adventure is in showing people my images. I do not know anyone with a medium format projector, my 35 mm lupe does not fit the larger trannies and I can not use a standard slide scanner either. Of course there are solutions to these problems, but although obvious this is a bit of a frustration. In conclusion, if you ever get the opportunity to use a medium format camera underwater then I strongly encourage you to grasp the opportunity with both hands (and you'll need both). But should you trade in all your 35mm gear for medium format? I think not. As great as the trannies are, a modern housed 35mm SLR remains the most efficient tool for underwater photography. Medium format is best reserved for special occasions. Reasonable care has been taken to ensure that the information presented in this book is accurate. However, the reader should understand that the information provided does not constitute legal, medical or professional advice of any kind.